Magnolia Mamas : Celebrating Our Curves! This last year we have both been doing our best to live healthier lifestyles. We've made it a priority to focus on our fitness and eating habits because we want to be in the best health possible for our family and ourselves. Not to mention you need a lot of condition training to keep up with our Mini Magnolias. A lot. We want to show our children that you can be active and healthy your entire life. We want to be role models for having a great body image to our girls, and putting an emphasis on overall health. We want to be able to play and have fun with our children, grandchildren, and maybe one day great-grandchildren. To do that we know we need to be active in investing time in our health and ourselves. All of that comes with work...but, it doesn't have to feel that way. We've found that you can have fun establishing healthy routines in your life. Doing so with some of your closest friends by your side - even better! We are so excited to announce our latest partnership with Curves®! For the next month we will both be participating at our local Curves®facility to learn more about our health, take part in some of their amazing fitness classes, and get advice from their knowledgeable staff. And we couldn't be more excited about it! We love that Curves® facilities are owned and operated by women. From the moment you walk in the door you know that everyone there "gets it". We are all women... moms, grandmothers, friends, teachers, corporate executives, etc. We are all in the same boat - women trying to obtain or maintain healthier lifestyles. A healthier us. We love that feeling of camaraderie and support, knowing that we all have the same goal. We love that Curves® makes it a priority to provide women with the tools to lead happier healthier lives, while understanding the immense pressures women are under. They've realized women are often on the go, and have perfected a way to provide women with quality studio fitness in just 30 minutes. Thirty! As busy moms to six children going in six different ways we totally appreciate that. Getting in a quality workout in thirty minutes or less in our world's is amazing! Today Curves® 25!! Twenty-five years of providing women with healthier lifestyles one life at a time and they are celebrating in a BIG way! Throughout the month of September Curves® has been hosting a number of special classes and giveaways to commemorate the special moment. 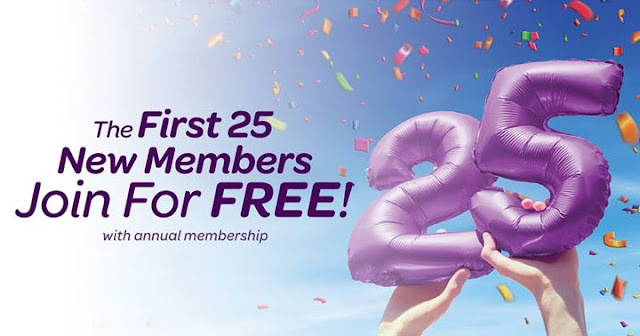 The first 25 new members at each facility get to join for free (With annual membership. Varies at each facility, and cannot be combined with other offers.). Today they are kicking off a huge bash, and will be celebrating around the globe with special workouts and in-club parties! Who doesn't love a good party? Non-members are also able to join in the fun at their local Curves for just twenty-five cents! The fun doesn't stop at the workouts though. Curves® will also be hosting fun giveaways through their Facebook and Instagram feeds all day! So if you aren't able to make it to a facility today to join the party, you still get the chance to win some fun goodies! We can't wait to get our (workout) party on! Will you be joining us today?